Lee Child. Photo by Mark Coggins. Lee Child has 1 media appearance. Over the course of three #1 New York Times bestsellers—61 Hours, Worth Dying For, and A Wanted Man—Jack Reacher has been on a journey. In Lee Child's latest suspense novel, however, he throws Reacher for a loop that will change the man forever, and send him into his most perilous mission yet. Finally arriving in Virginia, hoping to see the woman he spoke to on the phone in 61 Hours, Reacher finds himself drafted back into the Army and facing a case that digs deep into his past—and has personal ramifications that could change Reacher for life. You think you know America's most enduring thriller hero, but in Never Go Back, Child has a shock for fans so game-changing that you'll realize you don't know Jack. Lee Child is the author of 18 Jack Reacher thrillers; Tom Cruise starred in Jack Reacher, a movie based on One Shot. Child, a native of England and a former television director, lives in New York City. Book signing to follow. Lee Child will sign and discuss Never Go Back (Delacorte; $28). Lee has three homes—an apartment in Manhattan, a country house in the south of France, and whatever airplane cabin he happens to be in while traveling between the two. In the US he drives a supercharged Jaguar, which was built in Jaguar’s Browns Lane plant, thirty yards from the hospital in which he was born. We will start giving out numbers for this event on Tuesday, September 3rd. A copy of Never Go Back must be purchased from MBTB to go through the signing line and get anything signed. Come join Tommy and Wil the first Monday of every month at at 7PM as they explore the worlds of fiction's greatest mysteries. But you must hurry - the game is already afoot. This month's title is Killing Floor By Lee Child. Join host Sally Bissell for a discussion of The Affair, by Lee Child. 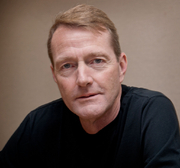 Lee Child is a LibraryThing Author, an author who lists their personal library on LibraryThing. Lee Child's book Manhattan Mayhem was available from LibraryThing Early Reviewers. Lee Child's book The Mystery Writers of America Cookbook was available from LibraryThing Early Reviewers. Lee Child's book Belfast Noir was available from LibraryThing Early Reviewers. Lee Child's book Personal was available from LibraryThing Early Reviewers. Lee Child's book USA Noir was available from LibraryThing Early Reviewers. Lee Child's book Never Go Back was available from LibraryThing Early Reviewers. Lee Child's book Vengeance was available from LibraryThing Early Reviewers. Lee Child's book 61 Hours was available from LibraryThing Early Reviewers. Lee Child's book Manhattan Mayhem was available from LibraryThing Member Giveaway. Lee Child is currently considered a "single author." If one or more works are by a distinct, homonymous authors, go ahead and split the author. Lee Child is composed of 10 names. You can examine and separate out names.